In the Blocks tab, drag and drop the Social Follow content block into the area where you want your social media links. 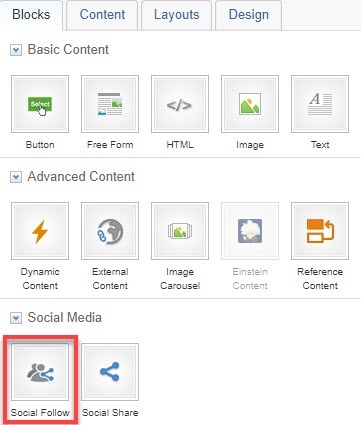 Hover over the Social Media Content block in the preview pane and click to edit. The Block editor will open on the left-hand side. Under "Social Network", you can select social media icons by clicking Add a Social Network and selecting the icon that corresponds with the network(s) you want to display. When you have added your social networks, enter the URLs in the URL fields. You can remove social networks by clicking the X to the right of the URL field. Click and drag the social networks to reorder them. After the social media icons have been added, select the alignment of the icons: Left, Center, or Right. Select Horizontal or Vertical for the layout. Select the style of your social media bar from the drop-down menu. If you want to have a text label with each icon, check the box for include text label with icon. Adjust the font and font color as desired. In the Block Settings tab, add the background, border, and spacing as desired.